Or are they? The other gorilla in the room is the nocebo effect, the dark side of the placebo effect. Just as sugar pills can despite being inert have pleasing effects, so too can they have noxious effects. The question, or rather its answer, suddenly gets a whole lot more complicated. A pill popper has unwanted symptoms. But are they side-effects, attributable to the drug? Might they have had the unwanted symptoms anyway? Might the unwanted symptoms be caused by the drug, not by its pharmacological action, but by its psychological nocebo effect: warned to expect sexual dysfunction, the patient experiences sexual dysfunction. These are the questions that fuel the statins for those at low risk of heart disease debate, a proposal currently on NICE’s hot-list. The benefit is probably real if somewhat unimpressive, with five year NNTs for non-fatal heart attack and stroke around 60 and 268 respectively (60/268 people need to take a statin for five years for one heart attack/stroke to be prevented), and infinity (even if everyone took statins there would be no effect) for all cause mortality. Mileages, according to others, do vary, but not greatly. With such wafer-thin benefits, it behoves us to look – primum non nocere - at possible harms. What if in preventing one non-fatal cardiovascular event we at the same time cause a raft of harmful side effects? This is where the buns in the fight get loaded not with jam but Semtex. We know that people on statins get diabetes and muscle damage. But people get diabetes and muscle damage anyway, and furthermore people taking pills are vulnerable to nocebo effects. Over recent weeks the media have been throwing their buns into the air, adding to the mayhem. 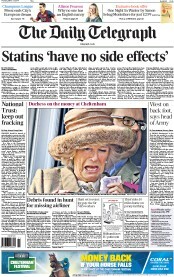 The Telegraph led with “Statins ‘have no side effects’”. Batting for the other side, the Express had “Health chief slams statins: Millions face terrible side effects”. What are we to make of all this? The public face of the ‘no side effects’ paper is none other than Prof G, pharmaco-epidemiology’s very own Einstein. It turns out the authors did the right thing, but with the wrong data. Pulling the plug on his own illuminations, Prof G now insists in the Guardian ‘Our paper on the side effects of statins used the right method to address an important issue, but our data was flawed’ – the gorilla, if not invisible, was ignored - which does beg a rather obvious question: why publish? In the other camp we have Bombardier Fee firing anything but blanks, and winding up Sir C no end. But – we’re really none the wiser: lots more heat, precious little light. One of the best ways to find the best of a fisherman’s catch is to ask what he will be taking home to cook for himself. In the same way, finding out what a doctor actually takes himself rather than prescribes for patients can be revealing. Dr No is not at low risk of cardiovascular disease, but, being Dr No, he does say ‘no’ to statins. Dr No, it appears, is not alone: more than half of GPs in a survey said they would not personally take a statin or recommend a family member do so based on a ten percent ten year risk score. Perhaps it is time doctors had a permanent Post-It note attached to their foreheads, proclaiming ‘Do as I do, not as I say’. Submitted by Typo Patrol on 22 Mar 2014 @ 10:17pm. "talking home" => "taking home"
Submitted by Typo Patrol on 22 Mar 2014 @ 10:18pm. It would behoove you to replace "behoves" with "behooves". Submitted by dr-no on 22 Mar 2014 @ 11:43pm. Typo Patrol - Dr No stands corrected on the first (and correction made), but begs to differ on the second, believing behoves to be the British spelling, behooves the American, and that it probably behoves British writing to stick with British spellings. Submitted by Sadly Amused on 23 Mar 2014 @ 3:07am. One wonders at all this vexation over statins - long hailed as the antidote for failing to be from a particular Mediterranean fishing village (or a Chinese peasant). Are we to be misdirected yet again from the serious discussions about society, health and medicine by Big Pharma, who has only a single agenda? Or is our time better spent addressing the issues as serious adults, and finally euthanizing the pill-for-every-ill/treat-the-symptoms approach used as our overarching model? Submitted by Shaheen on 11 Apr 2014 @ 6:56pm. Submitted by Dr. Bernbach on 28 May 2015 @ 8:56am.